Jeffrey Nichols is a New York based Wall Street economist, precious metals analyst, and gold-market guru, with nearly four decades experience in the business who has long been recognized as one of the world’s top experts in the economics and finance of precious metals. Besides bringing invaluable expertise to the Blackhawk Partners commodities team, Jeffrey provides expert analysis of precious metal markets and offers strategic consulting and market research services second to none. Jeff began his career as an international economist at Citibank, moved to Wall Street to head the international economic forecasting unit at Argus Research where he rose to chief economist, and then led the precious metals research group at Goldman Sachs before setting out on his own as a gold and precious metals market analyst. 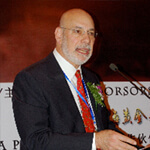 Over his long and successful career, Jeff has advised mining companies on financing and investor relations, served as a director of two public companies, managed a mining-related mutual fund, and worked with national mints, central banks, jewelry manufacturers, futures exchanges, and industry associations. He has been and still is a keynote speaker at dozens of investment and industry conferences, corporate meetings, and private company events around the world.